"HCCH" redirects here. For other uses, see HCCH (disambiguation). Not to be confused with ethane or ethene. Acetylene (systematic name: ethyne) is the chemical compound with the formula C2H2. It is a hydrocarbon and the simplest alkyne. This colorless gas is widely used as a fuel and a chemical building block. It is unstable in its pure form and thus is usually handled as a solution. Pure acetylene is odorless, but commercial grades usually have a marked odor due to impurities. As an alkyne, acetylene is unsaturated because its two carbon atoms are bonded together in a triple bond. The carbon–carbon triple bond places all four atoms in the same straight line, with CCH bond angles of 180°. Acetylene was discovered in 1836 by Edmund Davy, who identified it as a "new carburet of hydrogen". It was an accidental discovery while attempting to isolate potassium metal. By heating potassium carbonate with carbon at very high temperatures, he produced a residue of what is now known as potassium carbide, (K2C2), which reacted with water to release the new gas. It was rediscovered in 1860 by French chemist Marcellin Berthelot, who coined the name acétylène. Berthelot's empirical formula for acetylene (C4H2), as well as the alternative name "quadricarbure d'hydrogène" (hydrogen quadricarbide), were incorrect because chemists at that time used the wrong atomic mass for carbon (6 instead of 12). Berthelot was able to prepare this gas by passing vapours of organic compounds (methanol, ethanol, etc.) through a red-hot tube and collecting the effluent. He also found that acetylene was formed by sparking electricity through mixed cyanogen and hydrogen gases. Berthelot later obtained acetylene directly by passing hydrogen between the poles of a carbon arc. Commercially available acetylene gas could smell foul due to the impurities divinyl sulfide and phosphine. Since the 1950s, acetylene has mainly been manufactured by the partial combustion of methane. It is a recovered side product in production of ethylene by cracking of hydrocarbons. Approximately 400,000 tonnes were produced by this method in 1983. Its presence in ethylene is usually undesirable because of its explosive character and its ability to poison Ziegler–Natta catalysts. It is selectively hydrogenated into ethylene, usually using Pd–Ag catalysts. Calcium carbide production requires extremely high temperatures, ~2000 °C, necessitating the use of an electric arc furnace. In the US, this process was an important part of the late-19th century revolution in chemistry enabled by the massive hydroelectric power project at Niagara Falls. In terms of valence bond theory, in each carbon atom the 2s orbital hybridizes with one 2p orbital thus forming an sp hybrid. The other two 2p orbitals remain unhybridized. The two ends of the two sp hybrid orbital overlap to form a strong σ valence bond between the carbons, while on each of the other two ends hydrogen atoms attach also by σ bonds. The two unchanged 2p orbitals form a pair of weaker π bonds. Since acetylene is a linear symmetrical molecule, it possesses the D∞h point group. At atmospheric pressure, acetylene cannot exist as a liquid and does not have a melting point. The triple point on the phase diagram corresponds to the melting point (−80.8 °C) at the minimal pressure at which liquid acetylene can exist (1.27 atm). At temperatures below the triple point, solid acetylene can change directly to the vapour (gas) by sublimation. The sublimation point at atmospheric pressure is −84.0 °C. At room temperature, the solubility of acetylene in acetone is 27.9 g per kg. For the same amount of dimethylformamide (DMF), the solubility is 51 g. At 20.26 bar, the solubility increases to 689.0 and 628.0 g for acetone and DMF, respectively. These solvents are used in pressurized gas cylinders. Approximately 20% of acetylene is supplied by the industrial gases industry for oxyacetylene gas welding and cutting due to the high temperature of the flame. Combustion of acetylene with oxygen produces a flame of over 3,600 K (3,330 °C; 6,020 °F), releasing 11.8 kJ/g. Oxyacetylene is the hottest burning common fuel gas. Acetylene is the third-hottest natural chemical flame after dicyanoacetylene's 5,260 K (4,990 °C; 9,010 °F) and cyanogen at 4,798 K (4,525 °C; 8,177 °F). Oxy-acetylene welding was a popular welding process in previous decades. The development and advantages of arc-based welding processes have made oxy-fuel welding nearly extinct for many applications. Acetylene usage for welding has dropped significantly. On the other hand, oxy-acetylene welding equipment is quite versatile – not only because the torch is preferred for some sorts of iron or steel welding (as in certain artistic applications), but also because it lends itself easily to brazing, braze-welding, metal heating (for annealing or tempering, bending or forming), the loosening of corroded nuts and bolts, and other applications. Bell Canada cable-repair technicians still use portable acetylene-fuelled torch kits as a soldering tool for sealing lead sleeve splices in manholes and in some aerial locations. Oxyacetylene welding may also be used in areas where electricity is not readily accessible. As well, oxy-fuel cutting is still popular, and oxy-acetylene cutting is used in many metal fabrication shops. For use in welding and cutting, the working pressures must be controlled by a regulator, since above 15 psi (100 kPa), if subjected to a shockwave (caused, for example, by a flashback), acetylene decomposes explosively into hydrogen and carbon. Calcium carbide was used to generate acetylene used in the lamps for portable or remote applications. It was used for miners and cavers before the widespread use of incandescent lighting; or many years later low-power/high-lumen LED lighting; and is still used by mining industries in some nations without workplace safety laws. It was also used as an early light source for lighthouses. Except in China, use of acetylene as a chemical feedstock has declined by 70% from 1965 to 2007 owing to cost and environmental considerations. Acetylene can be semihydrogenated to ethylene, providing a feedstock for a variety of polyethylene plastics. Another major application of acetylene, especially in China is its conversion to acrylic acid derivatives. These derivatives form products such as acrylic fibers, glasses, paints, resins, and polymers. In 1881, the Russian chemist Mikhail Kucherov described the hydration of acetylene to acetaldehyde using catalysts such as mercury(II) bromide. Before the advent of the Wacker process, this reaction was conducted on an industrial scale. The polymerization of acetylene with Ziegler–Natta catalysts produces polyacetylene films. Polyacetylene, a chain of CH centres with alternating single and double bonds, was one of the first discovered organic semiconductors. Its reaction with iodine produces a highly electrically conducting material. Although such materials are not useful, these discoveries led to the developments of organic semiconductors, as recognized by the Nobel Prize in Chemistry in 2000 to Alan J. Heeger, Alan G MacDiarmid, and Hideki Shirakawa. In the early 20th century acetylene was widely used for illumination, including street lighting in some towns. Most early automobiles used carbide lamps before the adoption of electric headlights. Acetylene is sometimes used for carburization (that is, hardening) of steel when the object is too large to fit into a furnace. Acetylene is used to volatilize carbon in radiocarbon dating. The carbonaceous material in an archeological sample is treated with lithium metal in a small specialized research furnace to form lithium carbide (also known as lithium acetylide). The carbide can then be reacted with water, as usual, to form acetylene gas to feed into a mass spectrometer to measure the isotopic ratio of carbon-14 to carbon-12. Acetylene is a moderately common chemical in the universe, often associated with the atmospheres of gas giants. One curious discovery of acetylene is on Enceladus, a moon of Saturn. Natural acetylene is believed to form from catalytic decomposition of long-chain hydrocarbons at temperatures of 1,700 K (1,430 °C; 2,600 °F) and above. Since such temperatures are highly unlikely on such a small distant body, this discovery is potentially suggestive of catalytic reactions within that moon, making it a promising site to search for prebiotic chemistry. 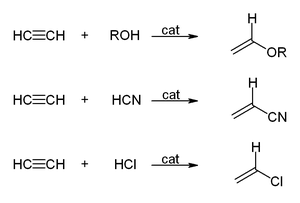 In vinylation reactions, H-X compounds add across the triple bond. Alcohols and phenols add to acetylene to give vinyl ethers. Thiols give vinyl thioethers. Similarly, vinylpyrrolidone and vinylcarbazole are produced industrially by vinylation of 2-pyrrolidone and carbazole. The hydration of acetylene is a vinylation reaction, but the resulting vinyl alcohol isomerizes to acetaldehyde. The reaction is catalyzed by mercury salts. This reaction once was the dominant technology for acetaldehyde production, but it has been displaced by the Wacker process, which affords acetaldehyde by oxidation of ethylene, a cheaper feedstock. A similar situation applies to the conversion of acetylene to the valuable vinyl chloride by hydrochlorination vs the oxychlorination of ethylene. Acetylene adds to ketones and aldehydes in the presence of base catalysts. With carbonyl groups to give α-ethynyl alcohols in ethynylation reactions: Formaldehyde gives sequentially propargyl alcohol and butynediol. 1,4-Butynediol is produced industrially in this way from formaldehyde and acetylene. Walter Reppe discovered that in the presence of catalysts, acetylene react to give a wide range of industrially significant chemicals. Fe(CO)5 + 4 C2H2 + 2 H2O → 2 C6H4(OH)2 + FeCO3 at basic conditions( 50-7002353150000000000♠80 °C, 20-7006253312500000000♠25 atm). In the presence of certain transition metals, alkynes undergo alkyne metathesis. Metal acetylides, species of the formula LnM-C2R, are also common. Copper(I) acetylide and silver acetylide can be formed in aqueous solutions with ease due to a poor solubility equilibrium. Various organometallic and inorganic reagents are effective. 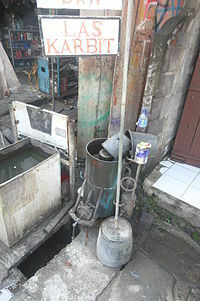 Acetylene is not especially toxic, but when generated from calcium carbide, it can contain toxic impurities such as traces of phosphine and arsine, which give it a distinct garlic-like smell. It is also highly flammable, as are most light hydrocarbons, hence its use in welding. Its most singular hazard is associated with its intrinsic instability, especially when it is pressurized: under certain conditions acetylene can react in an exothermic addition-type reaction to form a number of products, typically benzene and/or vinylacetylene, possibly in addition to carbon and hydrogen. Consequently, acetylene, if initiated by intense heat or a shockwave, can decompose explosively if the absolute pressure of the gas exceeds about 200 kilopascals (29 psi). Most regulators and pressure gauges on equipment report gauge pressure, and the safe limit for acetylene therefore is 101 kPagage, or 15 psig. It is therefore supplied and stored dissolved in acetone or dimethylformamide (DMF), contained in a gas cylinder with a porous filling (Agamassan), which renders it safe to transport and use, given proper handling. Acetylene cylinders should be used in the upright position to avoid withdrawing acetone during use. Information on safe storage of acetylene in upright cylinders is provided by the OSHA, Compressed Gas Association, United States Mine Safety and Health Administration (MSHA), EIGA, and other agencies. Copper catalyses the decomposition of acetylene, and as a result acetylene should not be transported in copper pipes. Brass pipe fittings should also be avoided. Cylinders should be stored in an area segregated from oxidizers to avoid exacerbated reaction in case of fire/leakage. Acetylene cylinders should not be stored in confined spaces, enclosed vehicles, garages, and buildings, to avoid unintended leakage leading to explosive atmosphere. In the US, National Electric Code (NEC) requires consideration for hazardous areas including those where acetylene may be released during accidents or leaks. Consideration may include electrical classification and use of listed Group A electrical components in USA. Further information on determining the areas requiring special consideration is in NFPA 497. In Europe, ATEX also requires consideration for hazardous areas where flammable gases may be released during accidents or leaks. ^ Nomenclature of Organic Chemistry : IUPAC Recommendations and Preferred Names 2013 (Blue Book). Cambridge: The Royal Society of Chemistry. 2014. p. 375. doi:10.1039/9781849733069-FP001. ISBN 978-0-85404-182-4. The name acetylene is retained for the compound HC≡CH. It is the preferred IUPAC name, but substitution of any kind is not allowed; however, in general nomenclature, substitution is allowed, for example fluoroacetylene [fluoroethyne (PIN)], but not by alkyl groups or any other group that extends the carbon chain, nor by characteristic groups expressed by suffixes. ^ a b c d NIOSH Pocket Guide to Chemical Hazards. "#0008". National Institute for Occupational Safety and Health (NIOSH). ^ "Acetylene - Gas Encyclopedia Air Liquide". Air Liquide. Retrieved 2018-09-27. ^ R. H. Petrucci; W. S. Harwood; F. G. Herring (2002). General Chemistry (8th ed.). Prentice-Hall. p. 1072. ^ a b c d e f g h i j k Pässler, Peter; Hefner, Werner; Buckl, Klaus; Meinass, Helmut; Meiswinkel, Andreas; Wernicke, Hans-Jürgen; Ebersberg, Günter; Müller, Richard; Bässler, Jürgen; Behringer, Hartmut; Mayer, Dieter (2008). "Acetylene Chemistry". Ullmann's Encyclopedia of Industrial Chemistry. doi:10.1002/14356007.a01_097.pub3. ISBN 3527306730. ^ Whitten K. W., Gailey K. D. and Davis R. E. General Chemistry (4th ed., Saunders College Publishing 1992), p. 328–329, 1046. ISBN 0-03-072373-6. ^ Edmund Davy (August 1836) "Notice of a new gaseous bicarburet of hydrogen", Report of the Sixth Meeting of the British Association for the Advancement of Science …, 5 : 62–63. ^ Miller, S. A. (1965). Acetylene: Its Properties, Manufacture and Uses. 1. Academic Press Inc.
^ Bertholet (1860) "Note sur une nouvelle série de composés organiques, le quadricarbure d'hydrogène et ses dérivés" (Note on a new series of organic compounds, tetra-carbon hydride and its derivatives), Comptes rendus, series 3, 50 : 805–808. ^ Berthelot (1862) "Synthèse de l'acétylène par la combinaison directe du carbone avec l'hydrogène" (Synthesis of acetylene by the direct combination of carbon with hydrogen), Comptes rendus, series 3, 54 : 640–644. ^ Habil, Phil; Sachsse, Hans (1954). "Herstellung von Acetylen durch unvollständige Verbrennung von Kohlenwasserstoffen mit Sauerstoff [Production of acetylene by incomplete combustion of hydrocarbons with oxygen]". Chemie Ingenieur Technik. 26 (5): 245–253. doi:10.1002/cite.330260502. ^ Habil, Phil; Bartholoméa, E. (1954). "Probleme großtechnischer Anlagen zur Erzeugung von Acetylen nach dem Sauerstoff-Verfahren [Problems of large-scale plants for the production of acetylene by the oxygen method]". Chemie Ingenieur Technik. 26 (5): 253–258. doi:10.1002/cite.330260503. ^ Wohler (1862) "Bildung des Acetylens durch Kohlenstoffcalcium" (Formation of actylene by calcium carbide), Annalen der Chemie und Pharmacie, 124 : 220. ^ Freeman, Horace (1919). "Manufacture of Cyanamide". The Chemical News and the Journal of Physical Science. 117: 232. Retrieved 2013-12-23. ^ Housecroft, C. E.; Sharpe, A. G. (2008). Inorganic Chemistry (3rd ed.). Prentice Hall. pp. 94–95. ISBN 978-0-13-175553-6. ^ Handbook of Chemistry and Physics (60th ed., CRC Press 1979–80), p. C-303 in Table Physical Constants of Organic Compounds (listed as ethyne). ^ "Acetylene". Products and Supply > Fuel Gases. Linde. Retrieved 2013-11-30. ^ ESAB Oxy-acetylene welding handbook – Acetylene properties. ^ "Lighthouse Lamps Through Time by Thomas Tag | US Lighthouse Society". uslhs.org. Retrieved 2017-02-24. ^ a b Takashi Ohara; Takahisa Sato; Noboru Shimizu; Günter Prescher; Helmut Schwind; Otto Weiberg; Klaus Marten; Helmut Greim (2003). "Acrylic Acid and Derivatives". Ullmann's Encyclopedia of Industrial Chemistry: pg. 7. doi:10.1002/14356007.a01_161.pub2. ISBN 3527306730. ^ Kutscheroff, M. (1881). "Ueber eine neue Methode direkter Addition von Wasser (Hydratation) an die Kohlenwasserstoffe der Acetylenreihe". Berichte der deutschen chemischen Gesellschaft. 14: 1540–1542. doi:10.1002/cber.188101401320. ^ Dmitry A. Ponomarev; Sergey M. Shevchenko (2007). "Hydration of Acetylene: A 125th Anniversary" (PDF). J. Chem. Educ. 84 (10): 1725. doi:10.1021/ed084p1725. ^ The 100 most important chemical compounds: a reference guide. ^ Grainger, D., (2001). By cars' early light: A short history of the headlamp: 1900s lights bore port and starboard red and green lenses. National Post. [Toronto Edition] DT7. ^ "Acetylene". Products and Services. BOC. Archived from the original on 2006-05-17. ^ Geyh, Mebus (1990). "Radiocarbon dating problems using acetylene as counting gas". Radiocarbon. 32 (3): 321–324. doi:10.2458/azu_js_rc.32.1278. Retrieved 2013-12-26. ^ ten Brink, Felix (2014). "Chapter 2. Living on acetylene. A Primordial Energy Source". In Peter M. H. Kroneck and Martha E. Sosa Torres. The Metal-Driven Biogeochemistry of Gaseous Compounds in the Environment. Metal Ions in Life Sciences. 14. Springer. pp. 15–35. doi:10.1007/978-94-017-9269-1_2. ^ "Precursor to Proteins and DNA found in Stellar Disk" (Press release). W. M. Keck Observatory. 20 December 2005. Archived from the original on 2007-02-23. ^ Emily Lakdawalla (17 March 2006). "LPSC: Wednesday afternoon: Cassini at Enceladus". The Planetary Society. Archived from the original on 2012-02-20. ^ John Spencer; David Grinspoon (25 January 2007). "Planetary science: Inside Enceladus". Nature. 445 (7126): 376–377. doi:10.1038/445376b. PMID 17251967. ^ a b Reppe, Walter; Kutepow, N; Magin, A (1969). "Cyclization of Acetylenic Compounds". Angewandte Chemie International Edition in English. 8 (10): 727–733. doi:10.1002/anie.196907271. ^ Trotuş, Ioan-Teodor; Zimmermann, Tobias; Schüth, Ferdi (14 November 2013). "Catalytic Reactions of Acetylene: A Feedstock for the Chemical Industry Revisited". Chemical Reviews. 114 (3): 1761–1782. doi:10.1021/cr400357r. ^ a b Viehe, Heinz Günter (1969). Chemistry of Acetylenes (1st ed.). New York: Marcel Dekker, inc. pp. 170–179 & 225–241. ISBN 978-0824716752. ^ Midland, M. M.; McLoughlin, J. I.; Werley, Ralph T. (Jr.) (1990). "Preparation and Use of Lithium Acetylide: 1-Methyl-2-ethynyl-endo-3,3-dimethyl-2-norbornanol". Organic Syntheses. 68: 14. doi:10.15227/orgsyn.068.0014. ^ Coffman, Donald D. (1940). "Dimethylethhynylcarbinol". Organic Syntheses. 40: 20. doi:10.15227/orgsyn.020.0040. ^ "Acetylene Specification". CFC StarTec LLC. Retrieved 2012-05-02. ^ a b c d e "law.resource.org CGA g-1 2009 (incorporated by reference)" (PDF). Retrieved 2016-11-30. ^ Downie, N. A. (1997). Industrial Gases. London; New York: Blackie Academic & Professional. ISBN 978-0-7514-0352-7. ^ Korzun, Mikołaj (1986). 1000 słów o materiałach wybuchowych i wybuchu. Warszawa: Wydawnictwo Ministerstwa Obrony Narodowej. ISBN 83-11-07044-X. OCLC 69535236. ^ a b c "EIGA Code of Practice: Acetylene" (PDF). Retrieved 2016-11-30. ^ "OSHA 29 CFR 1910.102 Acetylene". Retrieved 2016-11-30. ^ a b c "OSHA 29 CFR 1926.350 Gas Welding and cutting". Retrieved 2016-11-30. ^ Special Hazards of Acetylene UNITED STATES DEPARTMENT OF LABOR Mine Safety and Health Administration – MSHA. ^ Daniel_Sarachick (2003-10-16). "ACETYLENE SAFETY ALERT" (PDF). Office of Environmental Health & Safety (EHS). Retrieved 2018-09-27. ^ a b "NFPA free access to 2017 edition of NFPA 70 (NEC)". Retrieved 2016-11-30. ^ "NFPA Free Access to NFPA 497 - Recommended Practice for the Classification of Flammable Liquids, Gases, or Vapors and of Hazardous (Classified) Locations for Electrical Installations in Chemical Process Areas". Retrieved 2016-11-30. Acetylene at Chemistry Comes Alive!